Just off the Isle of Wight is the site of Bouldnor Cliff. Bouldnor Cliff was a Mesolithic settlement, dating to 8,000 years ago. The finds from this site include worked timber and flints, and show that the inhabitants were using technology that was 2,000 years more advanced than expected in a site of this age! The Mesolithic site is about eleven metres below the surface, and is part of the Solent Maritime Special Area of Conservation. Sadly, the tides of the Solent are eroding the site. More material is constantly being exposed, and subsequently is being threatened. 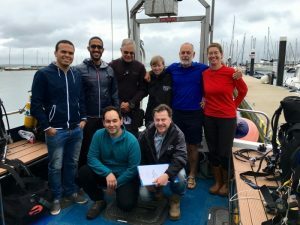 The Maritime Archaeology Trust is working hard to monitor the site’s condition, and to recover material that is coming under threat. The MAT is carrying out dives to create a record of the site, to document any changes that are taking place, and any exposed material. It is important to make frequent records of the site, and the plan is to use photogrammetry to create a 3D model. Divers first make a ‘pre-disturbance survey’, in order to ensure that the site is properly catalogued before making and changes or disturbing anything. Once the researchers are confident that there is a good record of the site and its contents, they are able to examine and rescue artefacts, and bring them to the surface for further study. These can be compared with the plan, in order to make note of where the artefacts were find, and piece together the site: a bit like putting together a big puzzle. 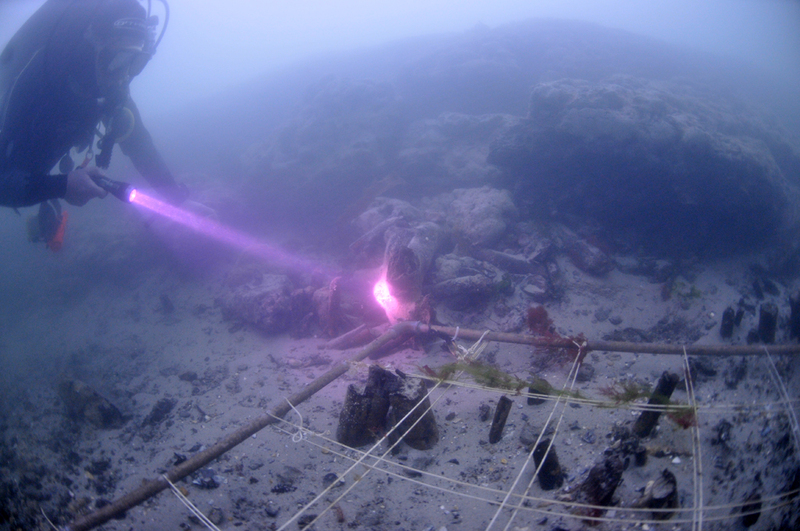 The divers set up a baseline at the site, in order to carry out the recording. A photographic survey was undertaken, to record the newly exposed features and document the site in its current condition, before any further work. The first thing seen by the divers as they approached the site was some newly exposed timber, protruding from the bank. This timber was not visible last year, and has been revealed by the erosion. It appeared to have been worked, and looks like it may even be the remains of a platform. Later dives will aim to further study these timbers, and rescue them. A later dive revealed a fellow archaeologist digging at Bouldnor Cliff: a lobster, with a collection of worked flints outside his burrow. Lobsters are frequent visitors to the site, and often turn up flints such as these. With the lobster’s help, the next dive recovered five small worked flints, and they were brought to the surface and inspected for the first time in 8,000 years. The first day was a grand success, with four dives in total. The last of these dives included two new visitors; volunteers from Egypt who had come to see the site and assist in the photogrammetry. They were very impressed with what they saw, and can’t wait to return to the site and continue their study. The work at Bouldnor Cliff will continue, to ensure that the site is safe, any threatened material is recovered, and that we learn everything we can from this exciting site. Why is Bouldnor Cliff so special? In 1999, whilst out diving, MAT discovered what we know as Bouldnor Cliff by the Isle of Wight. This used to be a highly populated area of land. Ever since the discovery there have been ongoing excavations and investigations to uncover the complex life of the people living on this piece of land during the mesolithic era, about 8000 years ago.